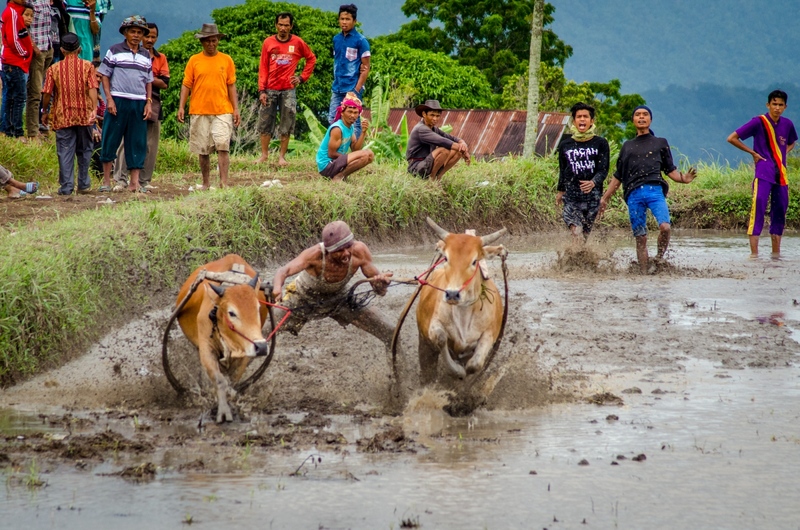 Here is a glimpse into the Indonesian bull races, known as Pacu Jawi. The event rotates in location and timing, depending on the harvest season, with this even taking place in the Tanah Datar district of West Sumatra, Indonesia. While it is a huge social and cultural event, the bull races also serve a functional purpose, helping to turn the soil in the paddys. Everyone in the nearby communities comes out to cheer, heckle, spectate and place bets on bulls and jockeys alike. The men acting as jockeys are tasked with staying “up” behind two bulls for as long and as far as possible, holding on by only their tails as their feet rest upon a small base to a simple wooden harness adorned by each bull. Three men cross the draining rice paddy as cows, farmers, riders and spectators arrive from all around the village and neighboring kampungs just east of Padang Pajang, West Sumatra. The water is drained from the usual depth of about 50 cm to less than half of that, so the riders and cattle can more rapidly slide through the mud during the event, Pacu Jawi (bull races). 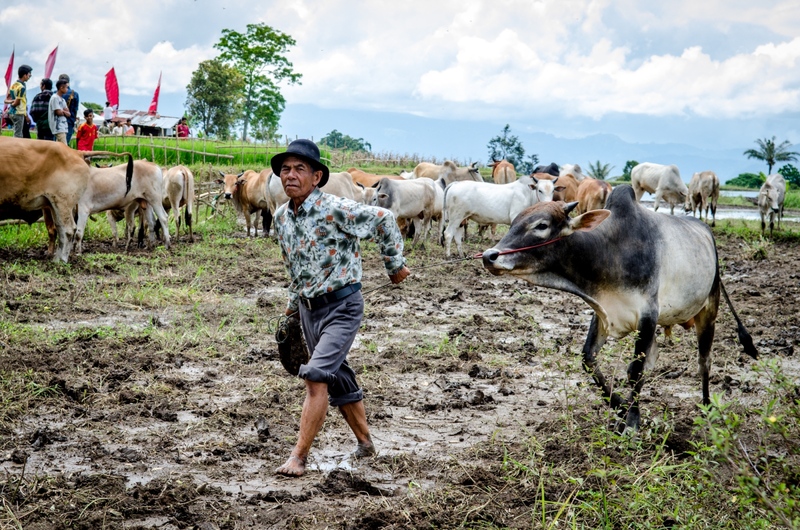 A farmer escorts one of his bulls into the waiting paddock in West Sumatra. Over 50 cattle from around the village were strutted about to get backers for the races. Both the riders and the owners can earn money from bets and buy ins on the cows that race. A man takes his first ride of the day, holding on to two powerful bulls by their tails, with his feet on small wooden blocks at the back of the simple wooden harnesses that drape across the backs of the stampeding cattle. The jockey's task is to stay standing behind the bulls for the longest and straightest ride, ideally lasting the entire run, which is about 80 meters long. Indonesians are highly social and Pacu Jawi allows not only for fascinating sport, but also community time. Here, a group of men have gathered, awaiting the start of the races. There is much conversation, whether scoping out the contenders, or just catching up with friends. Prepared for a long day out in the sun, the men are wearing unique headwear. 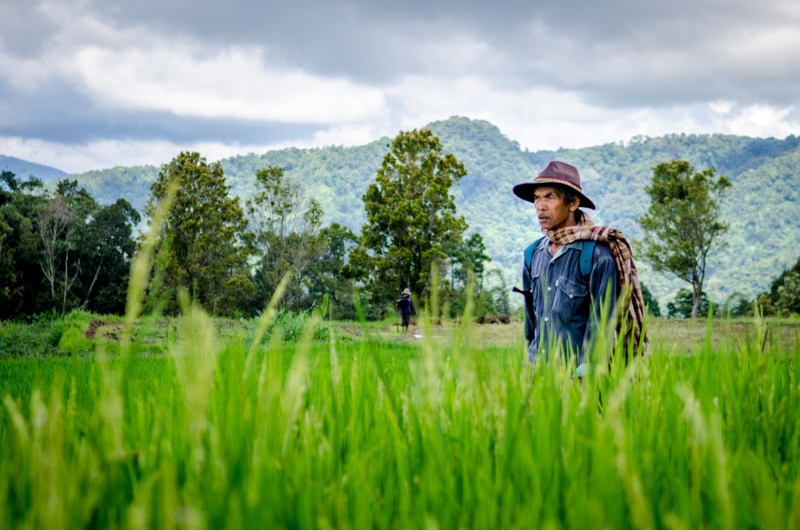 As the rice paddy is drained and the bulls are brought in, spectators begin to arrive, walking carefully along the narrow pathways through the fields and paddies that have not yet been harvested. The Indonesian sun is not forgiving and most of the West Sumatran crowd adorn unique headwear and scarves. The Bull Races bring in not only farmers and men of the village, but also the wives and daughters. 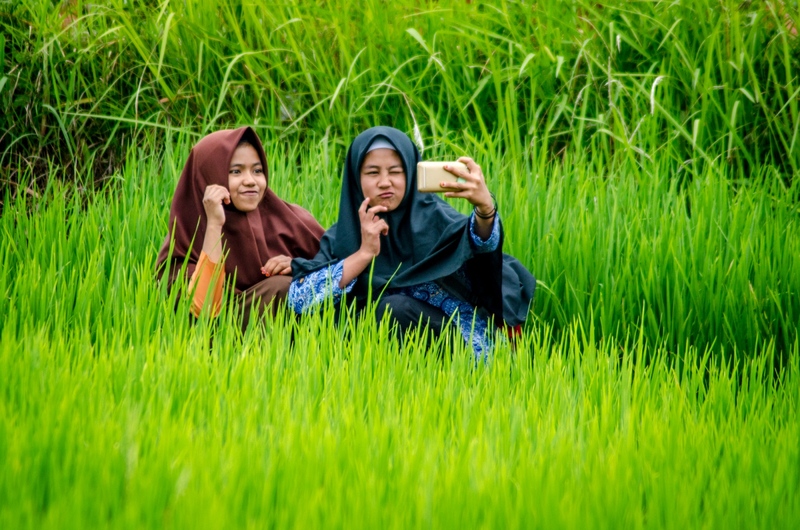 Some girls have used the opportunity for a photoshoot during the beautiful weather, waiting for the races to begin in the Tanah Datar district. The field of this season’s race lays at the base of Mount Marapi, with rich soil and a strong harvest. As the run begins, the jockey works to keep the bulls together, legs spread wide, as he reaches down to bite the tails, as is customary, to encourage a strong run from the powerful bulls. Fans look on as the the lap begins, hoping for a straight, fast and completed run. 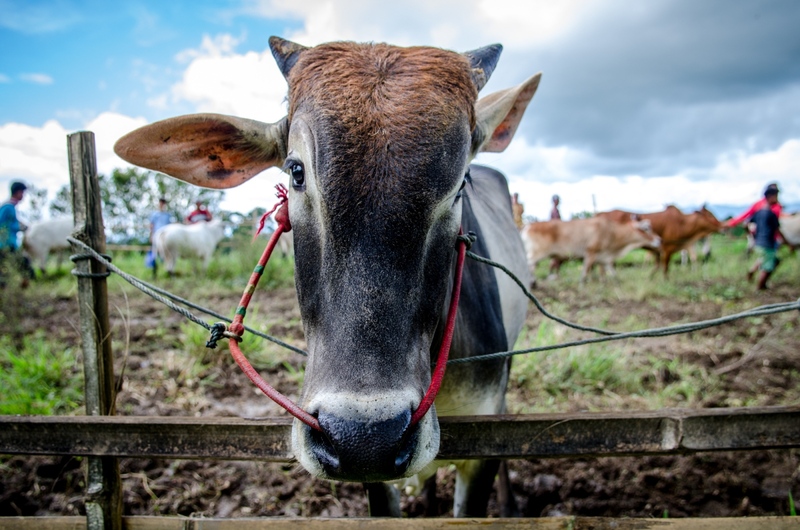 As more and more bulls, farmers, jockeys and spectators continue to arrive, farmers tie up their racing bulls in a paddock neighboring the draining rice paddy, where the races will take place. Pacu Jawi takes place at the end of a harvest season, bringing in contenders from neighboring kampungs for a community event. This tradition has been around for generations in West Sumatra, Indonesia. The cows are well cared for, not only helping on the homesteads, but hopefully earning families more funds from racing bets at this event. 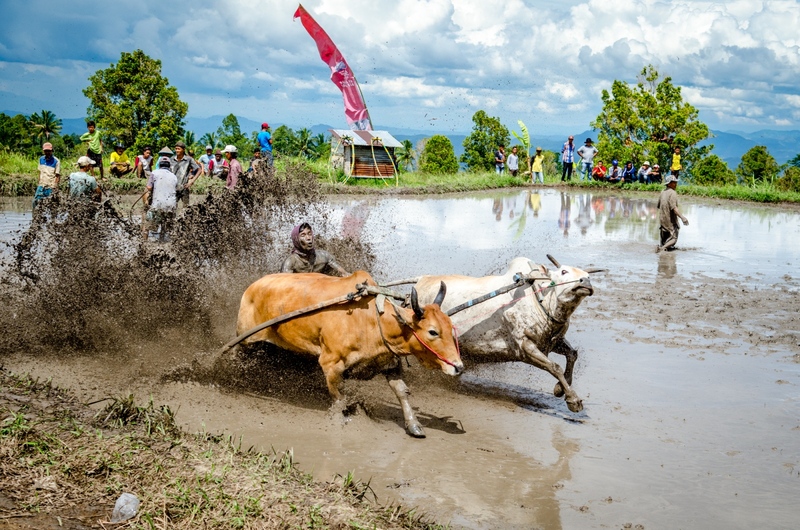 Pacu Jawi, the traditional bull races of Western Sumatra, Indonesia, offers up great entertainment and plenty of mud. As the bulls and jockeys finish a run, the paired bulls are usually loose, having been released by their jockey, and are wrangled by men standing by at the finish. 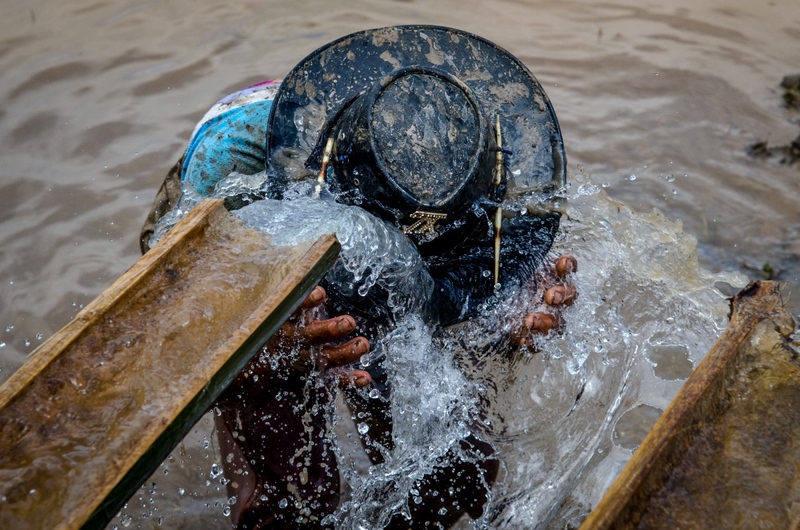 The men quickly lead the cattle to a much appreciated bath, to keep the mud from caking on. Man and bull alike appreciate the rinse down, bodies, faces and equipment, before they prepare for their next run of the afternoon. People come from many villages within the area to watch the races at Pacu Jawi. The location shifts kampungs (neighborhoods) each harvest season, using a partially drained paddy for the races, which incidentally helps to turn the soil before planting the next seasons seeds. 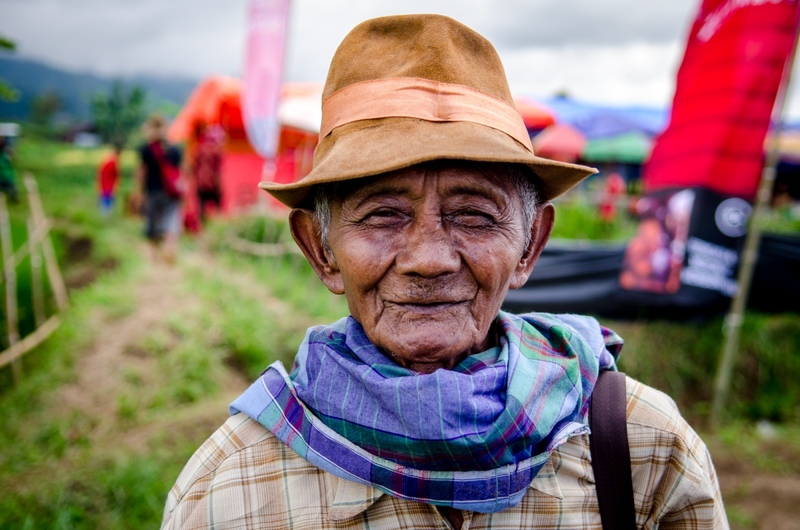 This older Indonesian man has come to watch the skilled jockeys and powerful bulls, mingle with friends and family and, likely, place a couple of bets along the way. 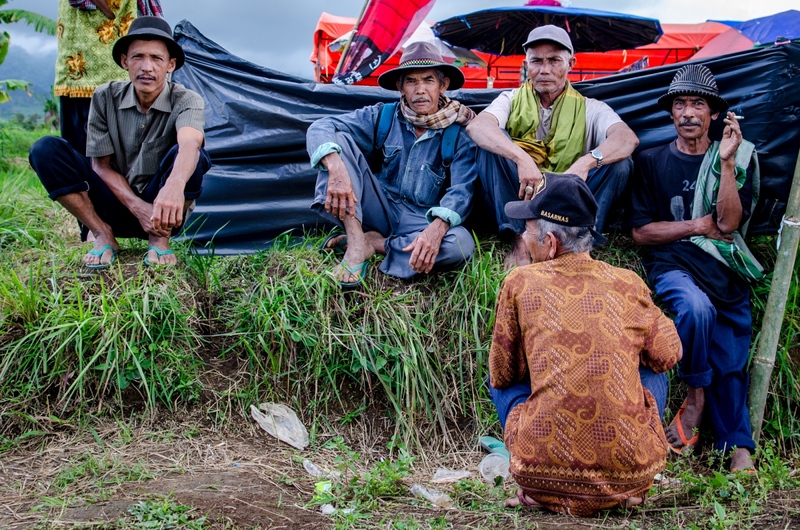 The all day event prompts appropriate sun protection, both hats and scarves, as the spectators are fully exposed in the middle of a field just south of Mount Marapi in West Sumatra, Indonesia. Men dive out of the way as the jockey and bulls take off for their run. The bulls are joined only by a small rope between their harnesses, and the jockey whose feet are based on their wooden harnesses they wear, and whose hands grip on to their tails as they run. 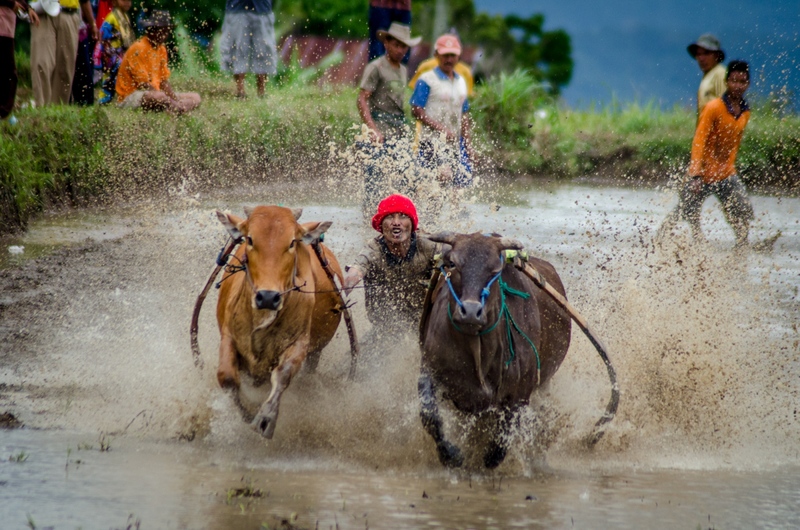 In Pacu Jawi, the Indonesia bull races of West Sumatra, the aim is to run the bulls as far and as straight as possible, adding in flair when possible. The race track is a partially drained rice paddy, being cleared out after the harvest. With his feet resting on small wooden pegs, the jockey tries to keep the bulls racing forward - without losing his grip, he may alternate hands for style points and bite the tails of the bulls to drive them on. Many of the spectators have put down money on both bull pairs and jockeys, and thus everyone certainly wants a good show. A muddy jockey relaxes with a cigarette between rounds, resting his muscles, catching his breath and taking in the sights. Perched alongside the rice paddy where the races are taking place, this young man must be well aware of his surroundings and ready to jump out of the way if any bulls decide to bolt over the ledge. When a pair of bulls arrive to the starting line in need of a jockey, he will mount back off to race down the track he sits in front of. Water flows in from neighboring Mount Marapi, bringing much appreciated refreshment and cleansing to riders, farmers, cattle and spectators. Here, a man rinses off after a mud-filled ride behind two charging bulls. 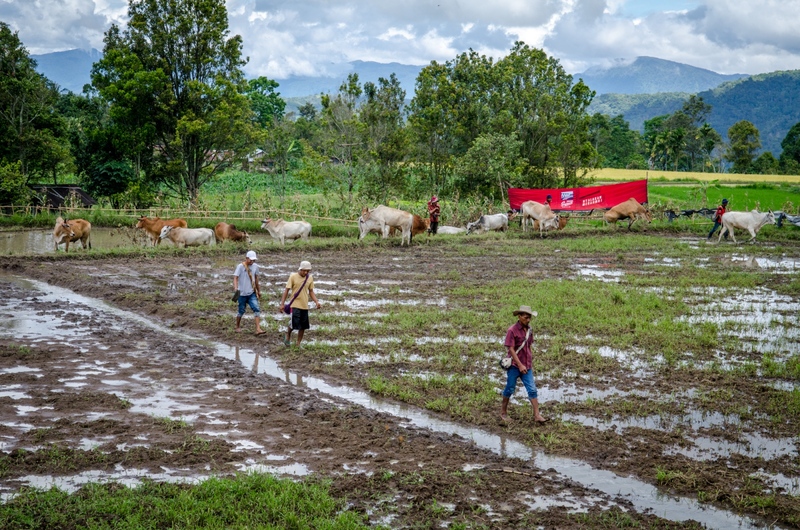 This Indonesian tradition, Pacu Jawi, is a great community event in West Sumatra, taking place at the end of harvest seasons. As the Bulls barrel down the rice paddy for the West Sumatran Pacu Jawi (bull races), their power is difficult to restrain. Simplistic wooden harnesses drape over the bull's shoulders, looping around and trailing behind their back legs joining back with a small wooden peg, intended for the feet of the brave jockey riding behind them. These men hold on to the tails of the bulls as the race towards the finish line in the muddy, splash-filled run. The racers that lead the most direct path and stay up the longest are the winners. Extra hands standby as bulls get loose, equipment flies, and the next race has likely already started just about 50 meters behind. 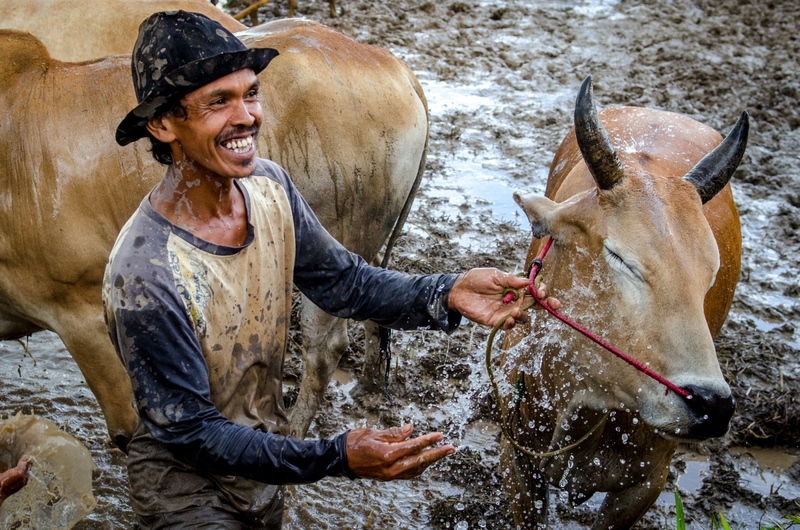 The farmers and jockeys alike take great care of the bulls and cows during Pacu Jawi, the West Sumatran bull races. 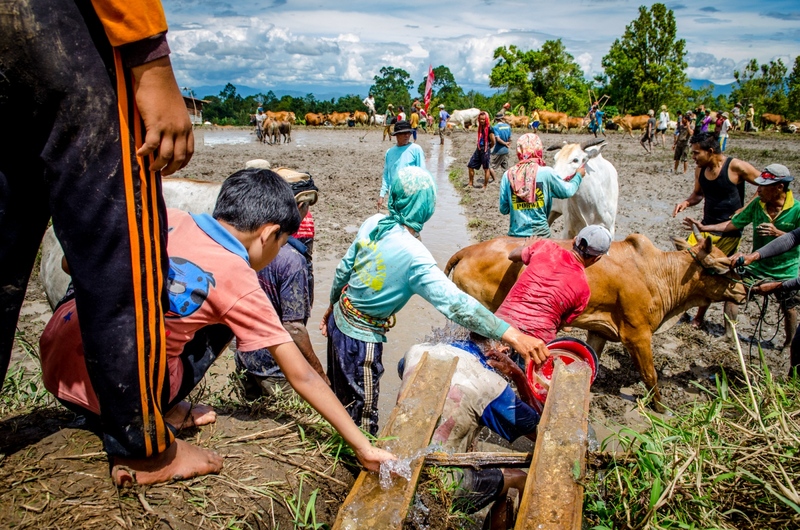 After their runs down the rice paddy, the cattle are caked with mud, but briskly herded over to the freshwater streaming down from Mount Marapi. 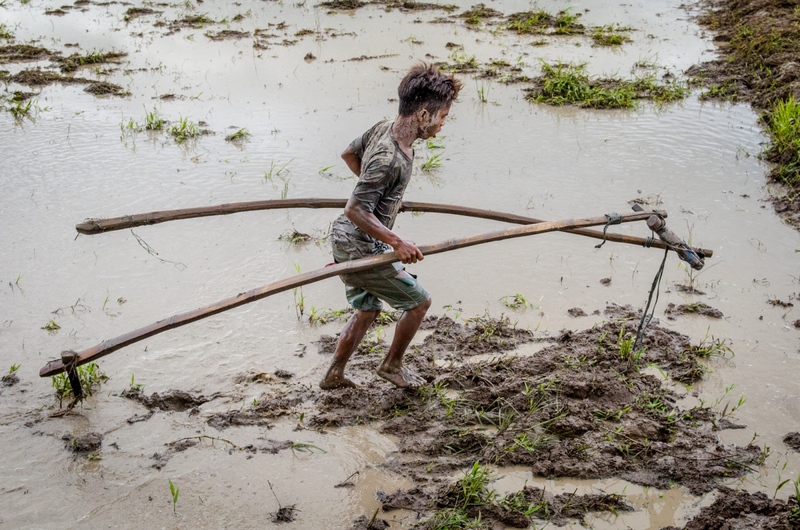 Normally used to irrigate the agricultural property, it acts as a perfect bathing station during the muddy event. 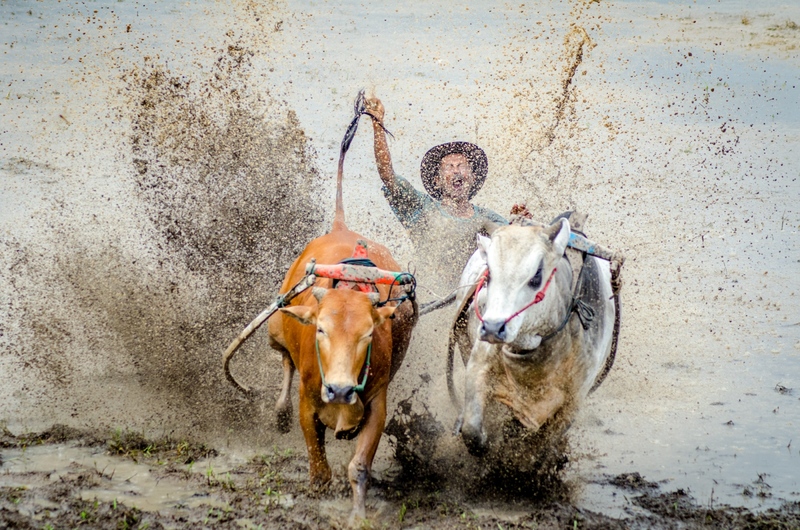 A jockey flails as he falls from behind two powerful, speeding bulls in the West Sumatran bull races, Pacu Jawi. This Indonesian tradition brings communities together at the end of a harvest season to race bulls, going for flair and time upright. This messy tradition also happens to help turn the fields for the host farmers.